Work on the cherry is moving along. 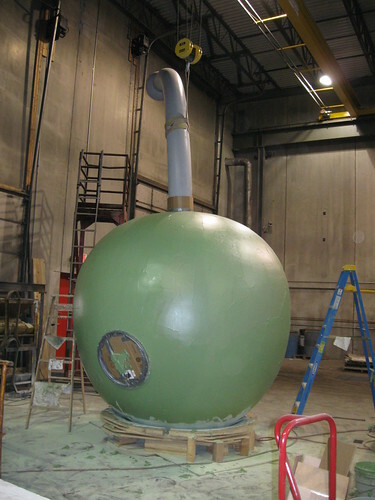 After being sandblasted and painted yellow, the cherry got a coat of green fairing compound, a finishing material similar to bondo. Most of what we see on the surface of the cherry will be sanded off on Monday, leaving the compound only in areas that are slight depressions on the surface. At this point all of the sanding is done by hand with a sanding block, to avoid any tool marks or depressions made from having a power sander in the same location for too long. This is extremely labor intensive, but critical to make the surface pristine. 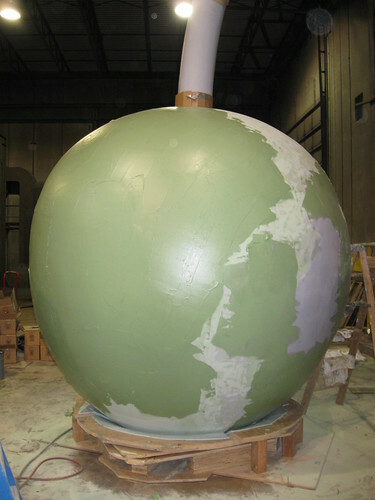 The stem is coated with the second coat of epoxy primer, gray, which is also under the fairing compound on the cherry. After sanding and filling, the entire work will be coated with another coat of the gray epoxy. The hand-sanding process is expected to take around two weeks to complete and may not be the most picturesque. We’ll keep you posted with progress updates.